But is the styling any better? The may not be quite good enough to make it a true BMW 3 Series fighter, but it’s still a better sedan than it was previously. Acura has revealed the facelifted TLX sedan here at the 2017 New York Auto Show and immediately we think it looks better, entirely because of its new front end styling. Gone is that chrome moustache look. In its place is the stretched pentagon grille that already debuted on the . Although the front-wheel-drive platform is the same, Acura claims the TLX has a "more aggressive and sporty look" inspired by last year’s Acura Precision Concept. Power comes from either a 2.4-liter VTEC four-cylinder with 206 hp or the optional 3.5-liter V6 with 290 hp. because it comes with Acura’s Super Handling All-Wheel Drive system. 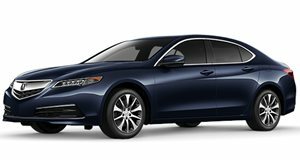 Now it’s being offered on all V6 TLX models, instead of only those equipped with the Technology or Advance Packages. Also new for 2018 is the TLX A-Spec trim, available in FWD or AWD, featuring an exclusive front fascia, round LED fog lights, aggressive side sills, rear diffuser with integrated dual-exhaust finishers, and a gloss black decklid spoiler. A set of dark finish 19-inch wheels and a sport-tuned suspension, stiffer spring rate and a rear stabilizer bar help to add a sportier feel to the car, but we can’t imagine the TLX suddenly becoming a proper luxury sport sedan overnight. The interior is also improved somewhat, and the A-Spec, specifically, offers sport-oriented refinements and premium features such as leather seats with increased bolstering, red driver’s meter highlights, brushed aluminum-look trim, and a thicker steering wheel. For what it’s worth, there’s red or black leather with Alcantara seat and door inserts. There’s also the standard AcuraWatch suite of safety technologies. More importantly, the 2018 TLX offers a refreshed dual-screen, which supports Apple CarPlay and Android Auto. We were never big fans of this dual-screen design, so here’s hoping this one is easier to figure out. Official pricing and on-sale date will be released in due course.